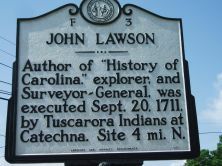 Author of "History of Carolina," explorer, and Surveyor-General, was executed Sept. 20, 1711, by Tuscarora Indians at Catechna. Site 4 mi. N.
John Lawson (1674-1711)—naturalist, adventurer, and author—was a key figure in early North Carolina history. A New Voyage to Carolina, the account of his travels across the Carolinas published in 1709, introduced much of Europe to the New World. Lawson served as Carolina’s first Surveyor General, and co-founded North Carolina’s two oldest towns. An ambassador to natives while promoting colonization, John Lawson was one of the earliest promoters of the Carolina territories. Little is known of Lawson’s early life. Born in 1674 to a prominent family in Yorkshire, Lawson received primary and advanced educations in London. Trained in the natural sciences, Lawson sailed to Charles Town in 1700, intending to gather specimens for English collectors. Later that year, Lawson and nine others embarked on a 550-mile, 57-day journey through Carolina’s unexplored regions. He kept record of his travels, meticulously describing flora, fauna, topography, and inhabitants of areas explored. Already a distinguished member of the frontier community, Lawson dedicated the next decade to a fledgling Carolina. He edited his journal for publication, hoping to attract new settlers with descriptions of Carolina’s fertile soil, abundant resources, and Indian culture. Published in 1709, A New Voyage to Carolina proved a resounding success, being reprinted several times for English and German audiences. Lawson also led expeditions to locate grounds ideal for settlement, as a result co-founding Bath in 1706 and New Bern in 1710. With an extensive background in survey and exploration, Lawson was commissioned by the Lord Proprietors as North Carolina’s first Surveyor General, tasking him to identify a border between North Carolina and Virginia, work later continued by William Byrd. In 1711, Lawson and two companions set out to discover the source of the Neuse River. 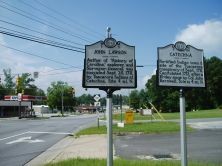 On their way, a band of Tuscarora Indians ambushed the party and led them as captives to Catechna, where Lawson, perhaps the strongest Indian advocate among the colonists, was executed on September 20, 1711. Although his contributions to North Carolina are often obscured by figures in later state history, Lawson, the rugged gentleman, helped to build the foundation upon which the state now rests.